The bus-size near-Earth asteroid 2012 JU (orbit delineated in blue) came within about 119,000 miles of Earth on May 13, 2012, but never posed a danger of hitting us. An asteroid the size of a school bus gave Earth a close shave yesterday (May 13), passing well inside the orbit of the moon, but our planet was never in any danger of being hit. The near-Earth asteroid 2012 JU, which is thought to be about 40 feet (12 meters) wide, came within 119,000 miles (191,500 kilometers) or so of our planet before zooming off into deep space, according to NASA's Near-Earth Object Program at the Jet Propulsion Laboratory in Pasadena, Calif. The moon orbits Earth at an average distance of 238,000 miles (382,900 km). The asteroid-tracking office put together an animation of asteroid 2012 JU's orbit to illustrate its Sunday flyby. The space rock completes one lap around the sun every 3.2 years, according to a Near-Earth Object Program database. Such close asteroid flybys aren't terribly uncommon. On April 1, for example, the 150-foot-wide (46-m) asteroid 2012 EG5 came within about 143,000 miles (230,000 km) of our planet during its closest approach. And on March 26, two smaller space rocks buzzed Earth. One passed within 96,000 miles (154,000 km), while the other missed us by just 36,000 miles (58,000 km). But those asteroids are all lightweights compared to 2005 YU55, a city-block-size space rock that came within 202,000 miles (325,000 km) of Earth last November. 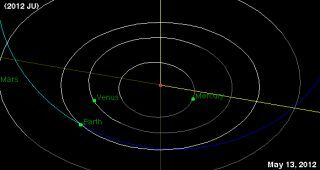 At 1,300 feet (400 m) wide, 2005 YU55 was the biggest asteroid to come so close to our planet since 1976, researchers said. Researchers have discovered about 8,900 near-Earth asteroids, though they think many more are out there. Scientists with the Near-Earth Object Program and other teams of astronomers regularly monitor the sky for large, potentially dangerous asteroids to determine if they pose an impact threat to Earth. Our planet occasionally gets pummeled by gigantic space rocks, sometimes with devastating consequences. For instance, the dinosaurs are thought to have been wiped out by a 6-mile-wide (10-km) asteroid that slammed into Earth 65 million years ago.